Maryland's already-strong gun laws will become among the strictest in the nation with a measure passed by the General Assembly Thursday, sending the bill to the Democratic governor who proposed the legislation in the aftermath of December's massacre at a Newtown, Conn., school. The state Senate voted 28-19 for final passage, agreeing to a number of changes the House of Delegates approved Wednesday. Maryland will become the first state in almost 20 years to require people who buy a handgun to submit fingerprints to state police. Only five other states have a similar requirement: Connecticut, Hawaii, Massachusetts, New York and New Jersey. 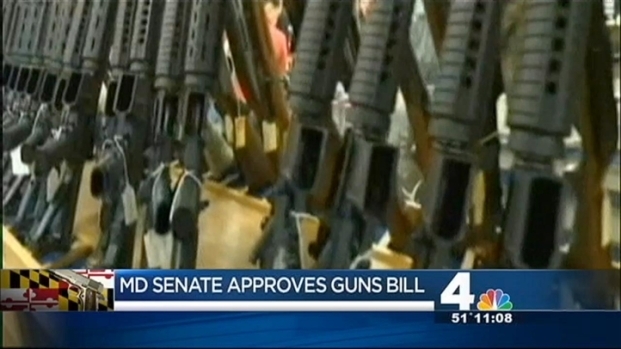 Maryland has passed a strict new gun control law. The measure also bans 45 types of assault weapons, although people who own them now will be able to keep them. People who order the weapons before Oct. 1, when the law would take effect, also would be able to keep them. The measure limits gun magazines to 10 bullets. It also addresses firearms access for the mentally ill. People who have been involuntarily committed to a mental health facility won't be allowed to have a gun. Also on Thursday, Connecticut Gov. Dannel P. Malloy signed into law sweeping new restrictions on weapons and large capacity ammunition magazines in response to the Sandy Hook Elementary School massacre there. Maryland Gov. Martin O'Malley, who is weighing a presidential bid in 2016, proposed the bill in January. Republican critics contend the bill is more about building O'Malley's resume than public safety. “This may be great for political aspirations, for presidential aspirations, to pound your chest. But honestly, after 12 weeks of work, the bill that's on the floor today will not improve safety of the citizens of Maryland one bit,” said Sen. E.J. Pipkin, R-Cecil. But Sen. Brian Frosh, D-Montgomery, disagreed. “This bill will do something very important. This bill will save lives,” Frosh said. Another provision requires someone to report a lost or stolen firearm, another effort to keep guns out of the hands of people who are not allowed to have them. The measure also calls for $25 million to be made available for schools to invest in security such as locks, cameras and buzzer entrance systems. O'Malley included $4.6 million in a supplemental budget this week to implement the bill. The money would pay for employees at a state police center to enforce the law. Maryland's legislative session is scheduled to end at midnight Monday.